Friday already! Of course there’s lots of peppers, but also a few other pretties here and there. The Yummy Peppers are finally producing. For some reason, they just take awhile to really start producing. It’s a good thing I got this picture early, because the Master Gardeners ate these up like candy. They are really sweet! 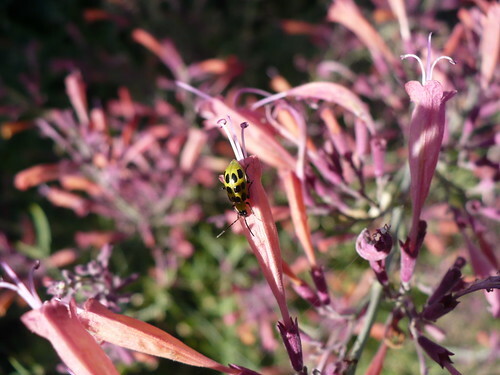 This is just a cool picture….a cucumber beetle on the flowers of a Root Beer Agastache plant. I love the colors and the contrast. Apparently the cucumber beetles like rootbeer flavor too! 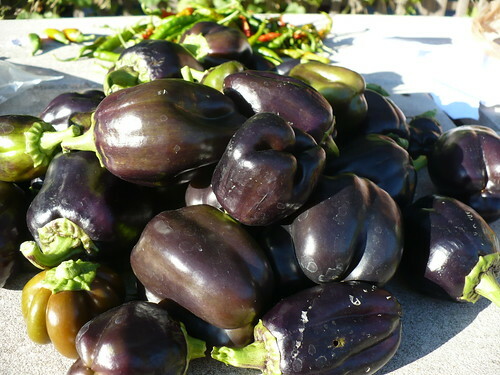 We had a pretty good haul from the two purple bell pepper varieties this week (Purple Beauty & Merlot). They are a little smaller than I would like, but I think they are normally smaller than what you would see in the grocery store. 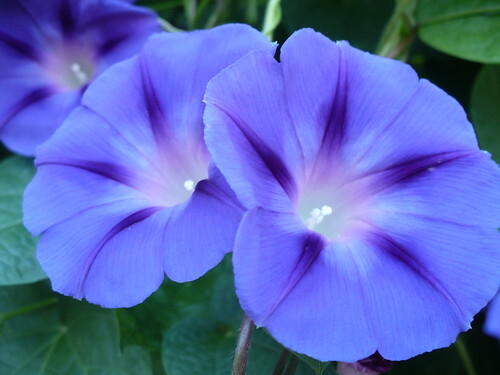 The morning glories are really showing off right now. They are an invasive pain, but they are also really beautiful. Better late than never, right? 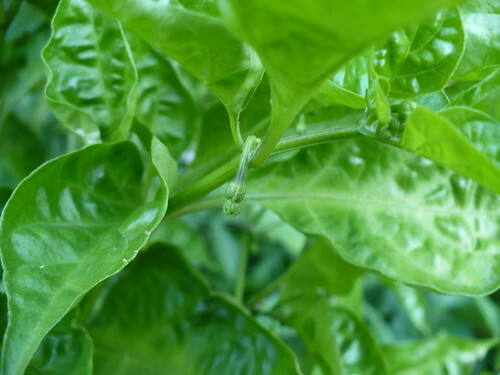 The Chocolate Habanero plants are FINALLY budded. 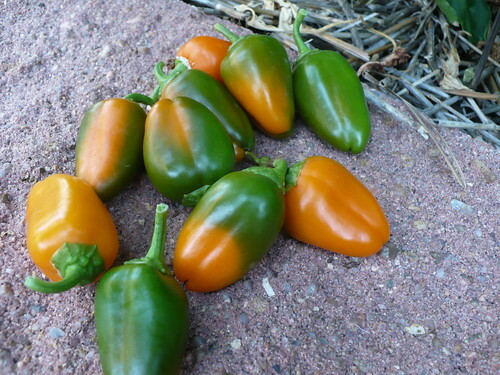 I just hope we get some ripe peppers before it gets too cold. If it has green tomatoes on it, let it stay. If it doesn’t have tomatoes on it, pull it out. Using that rationale, we removed the heirloom tomato planting this week. 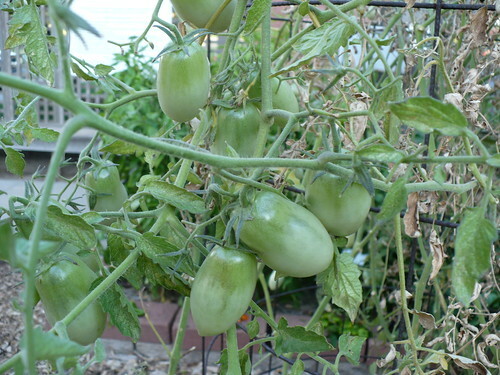 There were a few small, green tomatoes on a couple plants, but it wasn’t enough to justify continued watering and care. On the other hand, some of our other tomato plants have suddenly become quite loaded down with tomatoes! Now if only they would hurry up and ripen. At least the warm temps this week should move things along. Who would have thought we’d be looking for our first big flush of tomatoes in early October this year? Some of you are probably getting to the point where you are done with the garden for the year. Don’t forget to take good care of your tools before you lock up the shed for the winter! Family of 4 Garden – We break $200! 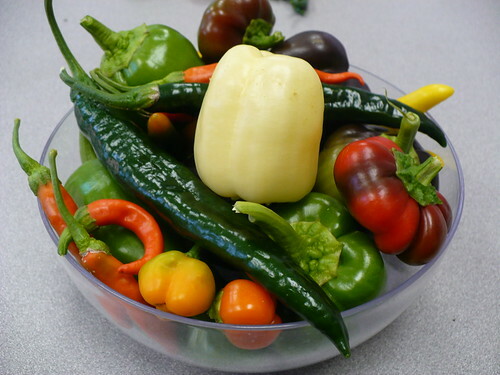 We are getting smothered in an avalanche of peppers, especially hot peppers. There are also a good number of green tomatoes coming on now. I hope they have time to ripen! This is a sampling of all the different peppers we’ve got right now. Granted, they aren’t all from the Family of 4 Garden. They were so pretty that I just had to share this picture. With all these peppers, just think where our total would have been without such an obnoxious summer? All those tomatoes that we didn’t get….cantaloupe, squash, cucumbers…we probably would be about $75-$90 higher, at least. Then we would be expecting as much as another $100 from fall vegetables and greens. It could have been a banner year! 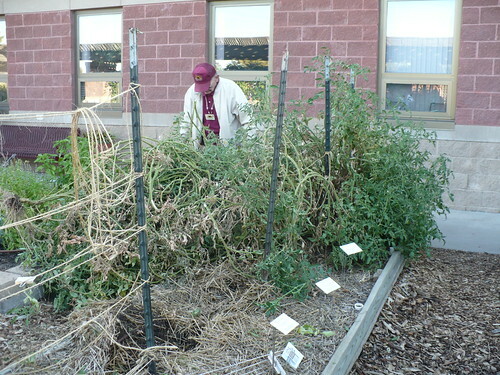 One of our Master Gardeners, who blogs over at Gaia Garden, has a really good post up reprising a talk she gave at our State Master Gardener Conference about Happily Sharing Your Garden with Wildlife. She shares her list of “morals” for gardening with wildlife. While you might argue that it’s a little different in an edible garden (or farm!) vs. an ornamental garden, these are still great principles to keep in mind. Moral #1: Don’t be too quick to judge an unknown [such as an insect or an egg mass] as a problem. Take time to observe and learn. When I found an egg mass like the one to the right one February morning, I was tempted to scrape it off the tree branch right away. I was convinced that any mass of eggs like this would be plant-eaters and therefore probably destructive in my yard or garden. Instead of doing that, though, I went back inside and searched on the web, trying to identify the eggs. I was able to do just that, and I learned that these are eggs from the wheel bug, an excellent insect predator. If I had destroyed the mass (and the others I found throughout the winter) I would have had many fewer predators in the yard…and many more pest insects.